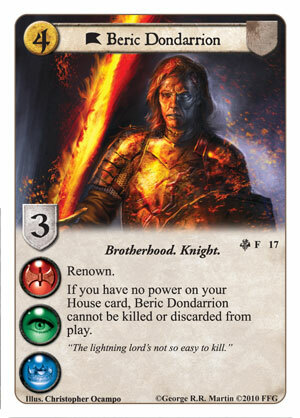 The king’s word in Westeros is law. Those who do not follow the rules are traitors to the crown and banished from the land or lose their head. Those who contest for the Iron Throne are truly fighting for the power to turn their words to law. 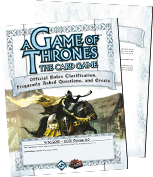 Don’t let another take your rightful place on the throne, read the new FAQ (pdf, 2.3 MB) and tournament rules (pdf, 760 KB) before venturing to the 2015 World Championships or your next A Game of Thrones: The Card Game tournament. These changes will go into effect on October 28th, 2015. By many accounts, the first edition card pool is in a relatively deep, interesting, and well-balanced place. There are a small number of outlier cards that currently strain the metagame, and with this FAQ update we are addressing those cards to prepare the environment for the first edition’s final World Championship and Stahleck Championship tournament season. In the North American Joust Championship at Gen Con, we saw two Dragonpit decks square off in the championship game. 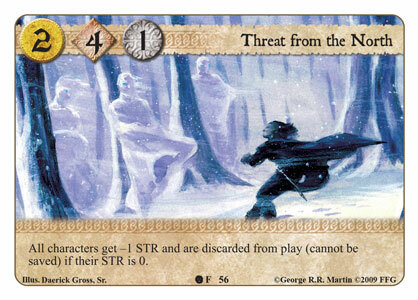 Due to the burden that the combination of The Dragonpit (Tales from the Red Keep, 74) and Threat from the North (Princes of the Sun, 56) places on the rest of the competitive environment, we have decided to break this combination by placing both of these cards on the restricted list. 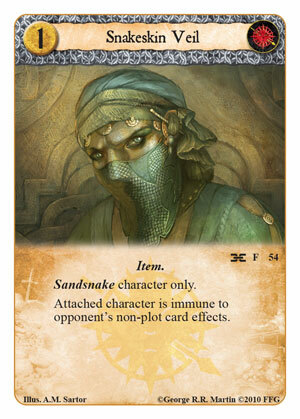 Two other cards are also being restricted at this time. 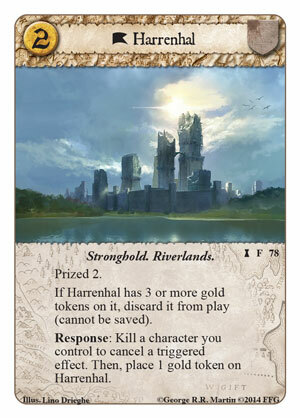 The first is Harrenhal (Ancestral Home, 78), which has been a pervasive neutral meta-defining card for more than a year, and we felt that increasing its opportunity cost by adding it to the restricted list would make the metagame more interesting for players to navigate. 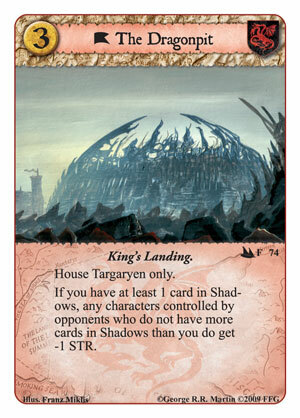 The final inclusion is the Valyrian Steel Link (Here to Serve, 117), a check against both a return to dominance by Maester decks, and against an overly efficient neutral draw engine. 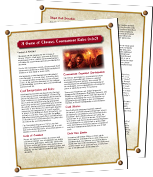 The new errata in this update addresses two relatively one-dimensional decks that tend to reduce the game to a “you either have a solution or you don’t” state, which many players found unsatisfying. 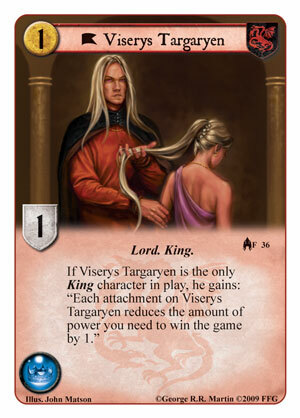 The errata to Viserys Targaryen (Kings of the Sea, 36) places a limit on how far his attachments can carry a player toward victory, ensuring that a deck built around him has a second dimension to seal the deal. 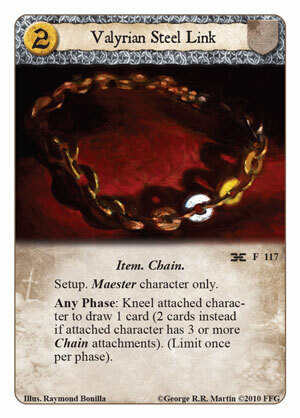 The errata to Snakeskin Veil (Called by the Conclave, 54) was made to prevent the use of this card, in conjunction with trait manipulation, to create a practically untouchable version of the already “cannot be killed” Beric Dondarrion (Illyrio's Gift, 17). With these adjustments, we hope you find the first edition metagame as interesting and enjoyable as possible for the World Championship and Stahleck events. It’s been a pleasure and an honor working on this first edition of the game for each of you over the past 10 years, and I sincerely hope you will continue the journey with us into the game’s second edition. Do you have what it takes to ascend the throne and turn your words to law? Download the new FAQ and tournament rules today so you’ll be ready for whoever challenges your claim.